Bring signs. Arrive on time to sign up to speak. Austin City Hall, 301 W. Second St.
and another 30 or so in the park. to the old pecan directly behind it marked for cutting. art teacher Desi Burke, a regular morning swimmer. replace trees they cut down. This tree was cut 2 years ago. See Twitter updates at end of post. 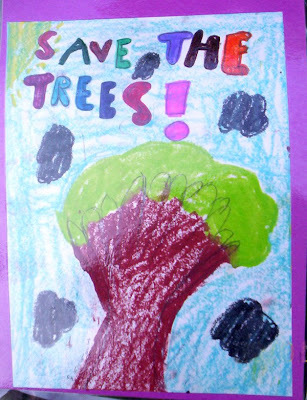 The children suggest we could take care of our trees. to cut down — this summer. Sign up to get SOS action alerts. save as many of them as humanly possible. shade to back up the old leaning pecan. It is 30 years old. really big trees. That these new ones will be safe. to the earth here for more than a hundred years? our children, blessings for these old souls, our heritage trees. a tree friendly paradigm for our home town. friendly paradigm for our home town. 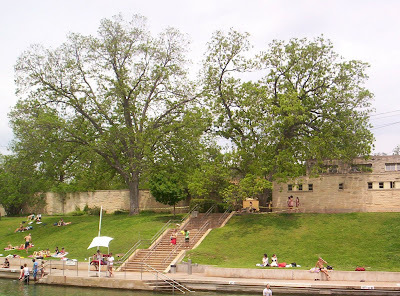 WHAT: We, the citizens of Austin, call on the City of Austin to slow down the plans of the Parks and Recreation Department (PARD) to cut down 28 heritage trees at Barton Springs Pool. 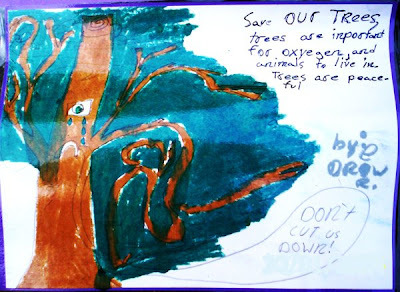 We are asking the City to investigate all alternative options to save these trees, as well as to consult further with local experts on their opinions and solutions to keep both citizens and the trees safe. We are not only asking the City to initiate measures to preserve the trees but also to consider a tree-friendly regime for all city parks that includes tree maintenance, planting and preventative care. 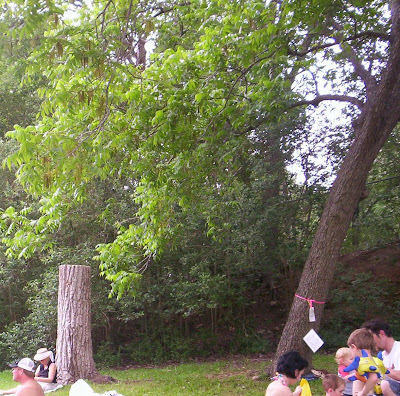 We appreciate the City's concerns regarding the safety of citizens and look forward to ongoing dialogue and together finding creative solutions to raise the needed monies to ensure that all city parks retain a beautiful, natural canopy of shade from healthy, stable trees. 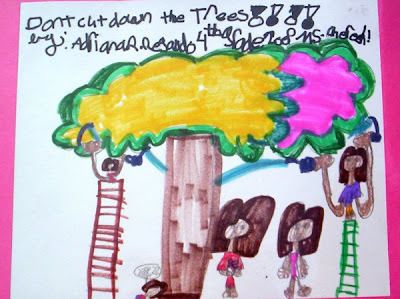 Click to read an independent study of the trees by ISA Certified Arborist Don Gardner. 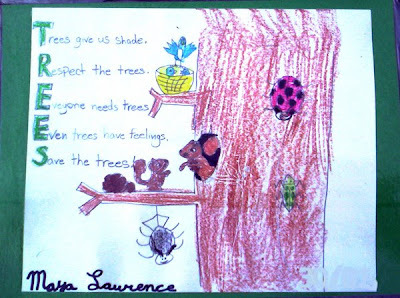 Click to view the Tree Report commissioned by the City of Austin. Here is their map of all the trees scheduled to be removed or pruned and monitored. Pink and green tape has been tied around the living trees to reflect the color coding on the map which indicates which trees will be removed (pink tape) or pruned and monitored (green tape). Music, poetry, letter, cell, text, emails to council and boards and commissions. 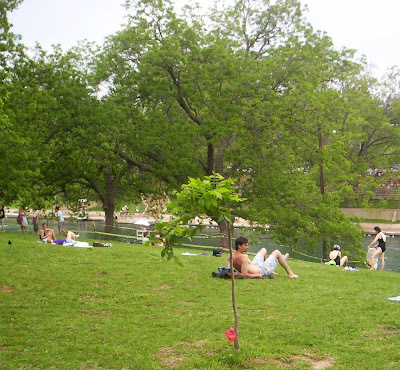 go to "Save Barton Springs Trees" on Facebook. it harder to cut down heritge trees has been postponed. Click to see Austin New Real program: Tree Friendly Paradigm featuring Susan Bright (SB), John Correy (arborist) and Pam Thompson (show host) recorded 23rd, tech by Stefan Wray.